Mission: A prayerful, loving ministry that reaches out to those in need of comfort and solace. Many blessings and prayers are woven into every shawl, throw, baby blanket, hat and booties. Do you hear God’s call to join us? Do you have a talent to share or would like to learn to knit or crochet? We have everything you need to get started. Consider joining us at a meeting or work at your own pace at home to create God’s loving embrace for those in need of our prayers and support as they face medical procedures and comfort after a loss or in time of stress, during an illness or recovery, for babies or anyone that needs to be “wrapped” in prayers. We’ve already distributed over 300+ shawls and throws! Informal on the 4th Thursday of the month at 6:00pm in the Gathering Area. Check the Bulletin for details. 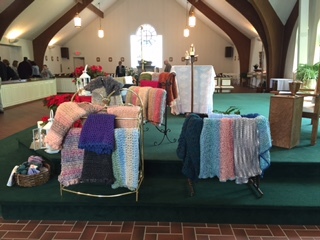 Create and distribute shawls and throws; Womankind; Blessing of the Shawls at Masses.